While it’s not as good as the last OneBlade deal we saw, this Amazon discount is a solid chance to save on our favorite shaving product ever. 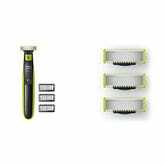 For a limited time, you can get a OneBlade plus three extra blades (four blades total) for $54 after you clip the $15 coupon. Those blades should last you 16 months at minimum, but honestly, probably longer.